Parent-teacher conferences provide a way for staff and families to better to connect to support students. They can also be stressful for all parties involved. Parents and teachers may be nervous about what the other will say to them about the child. To make conferences more pleasant and strengthen relationships remember the importance of promoting good will. Your job as a teacher will be easier if parents are your partners and look forward to your conversations with them about their child. While academic performance and test scores have their place, this information is easily accessed by parents. When you meet face-to-face parents want to know that you genuinely know and care about their child. Middle school English teacher and Y.A. author SJ Donovan explained that to prepare for parent-teacher night, she asked her students what they thought their parents wanted to hear from her about their class. Students shared that parents would want to know about her methodologies, teaching style, and how she integrates technology into learning. She shares their ideas in this post. Adding to Donovan’s idea, I would also ask each class member to share their response so that you have a personalized message for each parent. This also gives those less inclined to speak in public a chance to have their voice heard. You might want to consider using FlipGrid for this. (Not sure what FlipGrid is? Read this overview from Sean Arnold’s, “Brave in the Attempt” blog. When parent-teacher night begins, the teacher can kick it off to a parent group a discussion sharing with them what their children want them to know about how they spend their day. 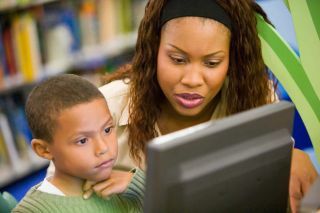 In some schools there can be limited time for one-to-one conversations. This strategy gives all parents a general sense of what they can expect for their child. If there is time for one-on-one conversations, the teacher can start by sharing that one idea their child wanted their parent to know. Next, the teacher can ask the parent what they want their teacher to know about their child and the teacher can record that in the child’s file or it can be left as a reply on FlipGrid. The teacher can review key pieces of the student’s learning profile with parent. Thrively is a tool that allows you to collect a free report of how every child thrives and ideas to support that at school and home. If possible, give the parent a printed report to take home. If you not able to print it, let them know how to access the report. This article shares more on Thrively and how students can begin their free strength assessment. In some schools teachers have a line of parents waiting out the door. Make use of that time. Have stations set up around the room for parents to learn more about what happens in the class. If possible each station would have a student at the helm sharing with parents. Stations can also be independently accessed. The stations could contain student work that is physical. It could contain a slideshow on a laptop with useful ideas for learning at home. There might be a station with recorded student presentations. Maybe there is a bulletin board where parents can scan QR codes to learn and see more about students and their work. Have an agenda that fits on one page so parents know what to expect and have a place to record notes. This helps you to frame and focus the conversation and provides follow up notes for the parent. Here’s a sample you can customize and use for your own class. What do you think? Are there ideas here that could work in your school or classroom? Have you tried any of these ideas? What has worked well? What challenges have you encountered? Lisa Nielsen (@InnovativeEdu) has worked as a public-school educator and administrator since 1997. She is a prolific writer best known for her award-winning blog, The Innovative Educator. Nielsen is the author of several books and her writing has been featured in media outlets such as The New York Times, The Wall Street Journal, Tech&Learning, and T.H.E. Journal.